To this day, French Catalans of the Roussillon refer to those beyond their frontiers as “gabatx” or foreigners. Travelling west from Perpignan along the D117, once you have left the Roussillon frontier town of Estagel you are effectively in another country with a different accent and patois: Fenolheda or Le Fenouillèdes in the Languedoc part of the Languedoc-Roussillon région. To this day, yob skirmishes between young Estagellois and young Maurynates (inhabitants of Maury, the first town over “the border”) are not unknown. If you travel about 15 kilometres north from Perpignan, by train or on the N9, you come to another frontier town, Salses-le-Château, beyond which you are again in the land of the “gabatx”: this time in the Aude département of the Languedoc. The two adjoining communes to the north and west of Salses are Fitou and Opoul-Périllos. Given this border mentality even today, it is no wonder that there was a need for a brand new fortress there at the end of the fifteenth century. 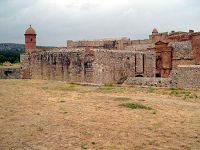 Salses was then the northern frontier post of the Spanish Kingdom of Aragon and had been under attack by the Arabs and the French for centuries. There had been a castle there since at least the 11th century, of which only a few ruins now remain, just to the north of the present fortress. Perhaps even earlier there had been a Roman defence position. Why Salses for a new fortress? In 1497 Ferdinand II, King of Aragon, retook possession of Salses after a devastating siege of the old castle by the French. 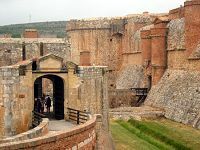 By then he had decided that a brand new fortress was crucial for the defence of the large province of Roussillon at the north-east end of his kingdom. In order to be an effective defence against the newly developed artilleries of canon fire, the fortress would have to be built from scratch. From about the middle of the 15th century, metal, and later bronze cannon balls could travel accurately at 300 metres per second. They inevitably necessitated changes in the structure of military fortifications. With money provided by his immensely wealthy wife Queen Isabella of Castile, King Ferdinand commissioned the Aragonese architect and expert in siegecraft Francisco Ramiro Lopez to design and build “the type of construction that could be built there [at Salses], capable of holding out against seige for 30 or 40 days, until help arrives”. Ramiro designed and built a military fortress – rather than a traditional residential castle – which had many Moorish features, since he had been already employed in working on the Alhambra at Granada. 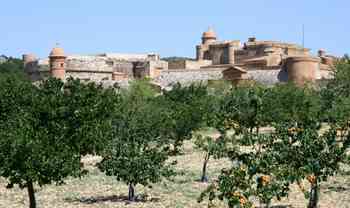 Salses was capable of housing 300 horses and 1,500 men. It therefore needed 50 bakeries with provision also for sheep, pigs, and cows for milk and butter. In the dairy there was an ingenious Arabic-type fridge system using running water to maintain a constant 9-10 degrees, even during the baking summer temperatures outside on the scorched-earth Roussillon plains. Indeed, the entire Moorish-style water provision for the whole fort, sourced in the Corbières mountains, was sophisticated and ingenious beyond belief. (See Jeroen van der Werf’s description referenced below). Salses cost the King and Queen a very pretty penny to build and equip: some 51,133,288 maravedis or 8,522,215 pence – say £35,510 – in 1503. According to the excellent guide who took us round – Mme Michèle Pilliez – this amounted to 20% of the total budget of Aragon. As you approach the fortress from the station or car park, the first striking impression is that little save the towers are visible. The outer walls are sunk deep into the red clay earth. As Sébastian de Pontault de Beaulieu (a royal cartographer and military engineer) wrote as long ago as 1639, “there is more room underground in this castle than above, for it is casemated and countermined all over, and there are passages under the moat to get to the outworks” (i.e. the projecting defences beyond the four perimeter walls). The active life of the fortress from the first seige in 1503 was really quite short – a little over 150 years. In 1639 the fort was taken by the French, only to be recaptured by the Spaniards in January 1640. It was again taken by the French, to be returned once more to Spain in September 1642. Finally with the signing of the Treaty of the Pyrenees in 1659 the fort became redundant: the province of Roussillon was assigned permanently to France. Thereafter the fortress was used only for barracks and storage to save the cost of demolition. In 1886 it became a national monument, then in 1930 it was handed over to the Ministry of Culture who restored it. Nowadays the Fortress is extremely well managed by the Centre des monuments nationaux and is enjoying a rolling programme of restoration.